Serrano, M.; Boguña, M.; Pastor-Satorras, R.
We develop a statistical theory to characterize correlations in weighted networks. We define the appropriate metrics quantifying correlations and show that strictly uncorrelated weighted networks do not exist due to the presence of structural constraints. We also introduce an algorithm for generating maximally random weighted networks with arbitrary P(k,s) to be used as null models. The application of our measures to real networks reveals the importance of weights in a correct understanding and modeling of these heterogeneous systems. Serrano, M., Boguña, M., Pastor-Satorras, R. Correlations in weighted networks. 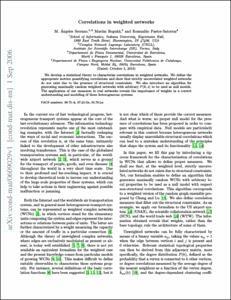 "Physical review E: statistical, nonlinear, and soft matter physics", Novembre 2006, vol. 74, núm. 5, p. 055101-1-055101-4.